Corporal Padishment is a mix of a whole bunch of characters, the strict army drill sergeant, your stereotypical western sheriff, and your mother when she has just found out you broke the antique vase in the hallway. The corporal wants to “padish” (punish) people, desperately, and if you get in his way, it will be you on the receiving end of his rocket launcher! 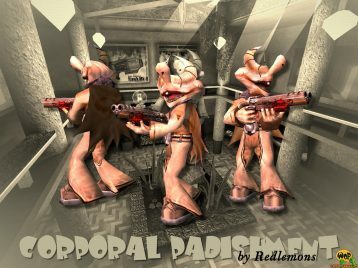 Corporal Padishment is an alternative skin for ENTE’s Padman created by Redlemons and it was the winner of the legendary Padman skin contest back in the days. This skin needs the player model Padman for Quake 3 Arena installed before.